Mugwort is a common name for several species of aromatic plants in the genus Artemisia. In Europe, mugwort most often refers to the species Artemisia vulgaris, or common mugwort. While other species are sometimes referred to by more specific common names, they may be called simply “mugwort” in many contexts. The Anglo-Saxon Nine Herbs Charm mentions mucgwyrt. 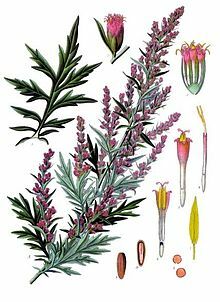 A folk etymology, based on coincidental sounds, derives mugwort from the word “mug”; more certainly, it has been used in flavoring drinks at least since the early Iron Age. Other sources say mugwort is derived from the Old Norse muggi (meaning “marsh”) and Germanic wuertz (wort in English, originally meaning “root”), which refers to its use since ancient times to repel insects, especially moths. The Old English word for mugwort is mucgwyrt where mucg-, could be a variation of the Old English word for “midge“: mycg. Wort comes from the Old English wyrt (root/herb/plant), which is related to the Old High German wurz (root) and the Old Norse urt (plant). In the European Middle Ages, mugwort was used as a magical protective herb. Mugwort was used to repel insects – especially moths – from gardens. Mugwort has also been used from ancient times as a remedy against fatigue and to protect travelers against evil spirits and wild animals. Roman soldiers put mugwort in their sandals to protect their feet against fatigue. Mugwort is one of the nine herbs invoked in the pagan Anglo-Saxon Nine Herbs Charm, recorded in the 10th century in the Lacnunga. In traditional Chinese medicine, mugwort is used in a pulverized and aged form – called moxa in English (from Japanese mogusa) – to perform moxibustion, that is, to burn on specific acupuncture points on the patient’s body to achieve therapeutic effects. Mugwort rice cakes, or kusa mochi are used for Japanese sweets called daifuku (literally ‘great luck’). To make these, take a small amount of mochi and stuff it or wrap it round a filling of fruit or sweetened adzuki (red bean) paste. Traditional daifuku can be pale green, white or pale pink and are covered in a fine layer of potato starch to prevent sticking. It is a common ingredient in rice cakes, teas, soups, and pancakes. Known as a blood cleanser, it is believed to have different medicinal properties depending on the region it is collected in. In some regions, mugwort thins the blood, while in another region, it is claimed to have hallucinogenic properties, causing some to pass out from direct skin contact (dermal absorption) with the active chemicals. For this reason, some Koreans also wear a silk sleeve when picking mugwort plants. Mugworts are used medicinally, especially in Chinese, Japanese, and Korean traditional medicine. One species, Artemisia argyi, is often called “mugwort” in the context of traditional Chinese medicine, or more specifically “Chinese mugwort”, or àicǎo (艾草) in Mandarin. Artemisia princeps is Korean mugwort, known locally as ssuk (쑥). It is also found in Japan, where it is known as yomogi (ヨモギ). ^ a b Edwards, Lin (17 January 2011). “Brewery from 500 BC reveals its secrets”. Archeology & Fossils. Physics News. doi:10.1007/s12520-010-0049-5. Retrieved 17 January 2011. ^ Allardice.P. A – Z of Companion Planting. ^ “A Historical Dictionary of the World’s Plant Foods: M-Q.” Cambridge World History of Food, edited by Kenneth F. Kiple and Kriemhild Conee Ornelas, vol. 2, Cambridge University Press, 2000, pp. 1804-1841. Gale Virtual Reference Library, http://link.galegroup.com.erl.lib.byu.edu/apps/doc/CX3450400202/GVRL?u=byuprovo&sid=GVRL&xid=7f5cc15a. Accessed 3 Dec. 2018. ^ Abad, María José; Bedoya, Luis Miguel; Apaza, Luis; Bermejo, Paulina (2 March 2012). “The Artemisia L. Genus: A Review of Bioactive Essential Oils”. Molecules. 17 (12): 2542–2566. doi:10.3390/molecules17032542. ^ “A Bite of China: The Story of Staple Food” (in Chinese). Retrieved 20 February 2013. ^ Kamaneko@msn.com, KAMANEKO WORKSHOP K.Okaeda. “YOMOGI”. www.shejapan.com. Retrieved 29 June 2017. ^ “Sign In”. PMID 12475905. Retrieved 29 June 2017. ^ Coyle ME, Smith CA, Peat B (2012). “Cephalic version by moxibustion for breech presentation”. Cochrane Database Syst Rev. 5: CD003928. doi:10.1002/14651858.CD003928.pub3. PMID 22592693. ^ “English Names for Korean Native Plants” (PDF). Archived from the original (PDF) on 25 May 2017.